Meet Rupert, he is a real character and will definitely put a smile on you face! He has been with us three years now and we can’t understand why no one loves him like we do! Rupert racing name Redley Rooster is 7yrs old now (Sept 2011) and on the smaller side for a lad. Rupert is very playful and loves his toys, he is so much fun and we cannot stress enough how lovable he is! He loves having a fuss and if allowed will climb onto your lap or sofa to make the most of it! Rupert has become a firm favorite with everyone who meets him but he would dearly love his own home. He doesn’t like dogs barking at him or ones that run up off the lead, but has proved with careful introductions that he can make friends with other dogs. He would make an ideal only dog, he may not be suitable for small children as he does jump up and might accidentally knock them over! He is happy to be left on his own for quite a while so may suit someone who still works. He would need a garden where he can let off steam and be the “crazy boy” we have come to know and love. 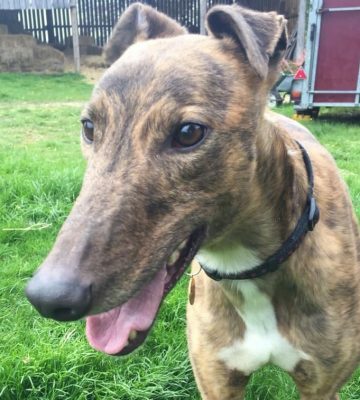 No one has told Rupert he is 7 yrs old and he is a bouncy, playful boy, however as with all greyhounds it doesn’t last long and he is prepared to chill out on the sofa or in his bed for most of the day.